The patent describes methods for the preparation of adsorbent carbon materials and for optimizing the storage of gases on these materials. The key feature of the adsorbent-gas system is an unusual increase in the isosteric enthalpy of adsorption with increasing pressure. A particularly challenging part of this work involved the construction of a specially-designed Sieverts apparatus for carrying out thermodynamic measurements of gas adsorption processes under pressure. 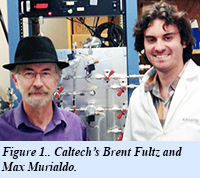 The work is described in two recent papers from the Caltech group [M. Murialdo, et al. J. Phys. Chem. C 119, 944-950 (2015); N. Stadie, et al. J. Am. Chem. Soc. 135, 990-993 (2013)], which report the adsorption of methane and ethane on zeolite-templated carbons, respectively. In a new paper, EFree graduate student Max Murialdo reports similar adsorption behavior for krypton on the zeolite-templated carbon materials described in the patent. This work extends the range of gases whose adsorption is significantly favored by zeolite-templated carbons prepared according the the patented process, as opposed to other, commercially available carbon materials. The authors further show that the isosteric ethnalpy of adsorption and other thermodynamic quantities may be used to understand the interactions between adsorbed species [M. Murialdo, et al., Langmuir 31, DOI: 10.1021/acs.langmuir.5b01497 (2015)].